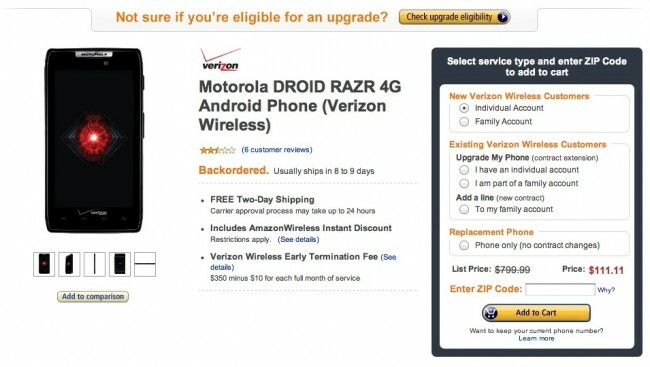 Late last night, news broke across the deal-o-sphere suggesting that Amazon Wireless would be selling the DROID RAZR for just $111.11 today only. And guess what? That’s exactly what happened. If you are thinking about joining the Big Red army and want this phone, you can sign up for service through Amazon and grab this brand new phone for about $188 under what everyone else will be paying. Notice I said “thinking about joining” because this deal is for new customers only. If you are looking to upgrade, you will still get a deal, but at $249 instead of the $111. Cheers to everyone who sent this in last night! DROID RAZR On Sale at Amazon Tomorrow for $111?